Be the first to share your favorite memory, photo or story of Rev. Delbert. This memorial page is dedicated for family, friends and future generations to celebrate the life of their loved one. Rev. Delbert J. Schrag, 97, a resident of the Forest Grove community, died Wednesday, November 28, 2018 at his home. Delbert J. Schrag was born on his family farm in southeastern South Dakota on Oct. 13, 1921, the seventh of nine children. Life for his family, which included two sisters and six brothers, revolved around farm work, sports and a local Mennonite Church, where his father served as co-minister. Like many men of his age, Del’s life was changed by World War II. He had completed two years of junior college and one year of teaching at the one-room schoolhouse he had attended as boy when, in 1942, he was drafted. As an active member of a recognized “peace church,” he applied for Conscientious Objector status and the draft board granted that request. He served his country through the duration of the war, working with crews of fellow “COs” at Civilian Public Service camps in South Dakota, where they built a regional dam; Florida, where they built sanitary privies in a poor community battling hookworm; and California, where Del helped contain a forest fire just as the war ended. After being discharged from CPS in April 1946, Del returned to South Dakota and married Stella Waltner, whom he often described as “the best-looking girl” at the neighboring Mennonite church. 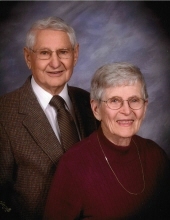 The young couple moved to Kansas, where Del completed his undergraduate degree at Bethel College. He and Stella then moved to Chicago, where he enrolled in the University of Chicago Divinity School. While there he was assigned, as a student pastor to a struggling Congregational church in a farming community north of the city. The expectation was that the young pastor would help the dwindling number of church members merge with a larger Congregational church in a nearby town. However, as Del told the story, the “stubborn old German farmers” had other ideas, and soon they won over the young pastor, who had grown up speaking German on his South Dakota farm. Instead of closing the church, he helped revive it and in 1971, the members of the Ivanhoe Congregational Church celebrated the 22 years that Rev. Schrag had served as their pastor, building a vibrant, growing community of faith, while he and Stella raised their growing family of four daughters and a son. In January 1972, Del took on a new challenge, accepting a position as an Area Conference Minister for the Illinois Conference of the United Church of Christ and moving the family to the western suburb of Lombard. In his new position, Del worked with local congregations with a host of issues, from declining memberships and internal church politics to the changing demographics of the metropolitan area and the struggle to make the denomination welcoming to all people, regardless of gender, race or sexual orientation. His passion for social justice served him and the denomination well. Del retired in 1990 and stayed busy with his flower and vegetable gardens, traveling with Stella and occasionally serving as an interim minster. They spent many winters in Tucson, where they owned a townhouse near three of their daughters, exploring the desert and spending time with grandchildren. At the time of his retirement, he and Stella had relocated to another suburb, Wheaton, while their children had settled on the West Coast. So, in the summer of 2004, he and Stella made one more big life change, moving to Forest Grove, where their son, John, and his family lived. Here the couple was welcomed by the Forest Grove United Church of Christ, which was an important part of Del’s final years, embracing his quest for a world with less conflict and his ongoing exploration of the power and mystery of the Holy Spirit. During the last two years of his life, as the effects of Del’s Alzheimer’s took hold, he and Stella were aided and comforted by an amazing caregiver and friend, Deena Barrett, who shares their home. Del was preceded in death by his parents, John J.A. and Katie Schrag; two sisters, Edna and Emma; and four brothers; Silas, Paul, Felix and Oswald. He’s survived by two brothers, Allen (Ardelle) and Calvin; his wife, Stella; his five children (and their spouses), Kathryn (Martin), Jan (David), Megan (Erec), Barb (Paul) and John (Karen); and his nine grandchildren: Rosie, Aaron, Ariel, Dayna, Sean, Jordan, Elena, Aidan and Nathaniel. To send flowers or a remembrance gift to the family of Rev. Delbert J Schrag, please visit our Tribute Store. "Email Address" would like to share the life celebration of Rev. Delbert J Schrag. Click on the "link" to go to share a favorite memory or leave a condolence message for the family.